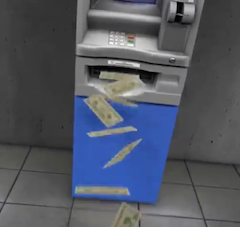 Let’s not pretend that the sight of an ATM spewing cash out of its mouth like it hit the oil can just a little too hard last night isn’t something we’ve all dreamed of, though knowing full well that we’d never steal in real life. But it’s far from a dream for cybercriminals who have figured out how to trigger malware infections that get ATMs to spit cash just by sending a text message. This text-and-spew scheme works on a certain type of standalone ATM, according to security vendor Symantec in a blog post yesterday (via PCWorld). The software is called “Ploutus” and was first spotted in Mexico. Symantec isn’t saying which kind of ATM can be hit with this malware, but did test the system out on one of the machines to see how it works. Installing Ploutus is tricky, and villains would have to access to the machine in order to jerry-rig it to barf cash. That’s likely why standalones are more at risk, as they’re more exposed than the kind nestled into a bank of ATMs. The whole set-up is controlled from a distance by a text message, with an infected phone connected inside the also infected ATM to a USB port. “When the phone detects a new message under the required format, the mobile device will convert the message into a network packet and will forward it to the ATM through the USB cable,” writes Daniel Regalado, a Symantec malware analyst. From there, a “money mule” or someone else hired to be the cash collector grabs the dough and carts it off. And there’s no skimming off the top, either — whoever is in charge knows exactly how much money the ATM will spit out.